U.S. D. A. Natural Resources Conservation Service and was responsible for all Conservation activities by this agency in both Oregon's Clatsop and Columbia Counties. I was required to work in the field and I often had to attend night meetings seventy to ninety miles away from home. I would work two days in one county and three in the other. My employer encouraged me to stay over night in a hotel rather than driving home during late evenings. I would, on occasion, bring my wife with me so that she could visit with friends. I dropped my wife off at my hotel. She planned to meet a school nurse friend later on that day. I bid her goodbye and I headed out to do my job. It was late in the day when I met my wife at our hotel. We were both hungry and decided to have an upscale dinner at Pier 11 in Astoria. My wife really enjoyed eating at that restaurant. We sat by the window and watched sea lions bobbing for fish waste from a nearby cannery. The waitress took our order. They had a special on Halibut. "You can't believe what we did today, "gushed my wife as we were being served. "I don' know," I answered as I stuffed food into my face, "What?" "We checked the kids at Warrenton Elementary for head lice, giggled my bride. "Sheesh," it's dinner time," said I. "What did you do with them? Did you send them home?" "Yes and no." replied my wife. "We kept them until school was over, then sent them home with a note to their parents. The parents were told that their children had to be lice free before they could return to school." "Not really," replied my wife. "Some parents won't do a thing for their kids unless they are forced. It was awful, a couple of the kids heads were crawling with parasites"
"They probably don't wash their hair," I said, "and their homes are probably dirty." "Not really," replied my wife. "Head lice have no preference for dirty hair or clean hair. If they wash their hair, then the lice will be clean. The same thing applies to their home. Lice can only live in people's hair, not anywhere else." "Yuch" said I. "Are you going to finish that piece of Halibut?" Head lice and humans have had a long history together. These small insects have lived with human beings for millennia. Preserved louse remains have been found on prehistoric mummies and it is evident that they have had a close relationship with us. They are an insect that is so specialized that they can only live in human hair. The creatures live by feeding on blood from people's scalps and necks. Lice don't really care about a person's economic status. Their presence does not connote a lack of hygiene or sanitation on the part of their hosts. They are wingless, and can not fly or jump. 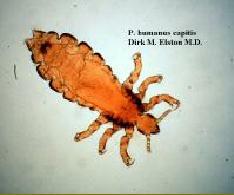 Head lice are mainly acquired by direct head to head contact, or sharing of combs. The more social children are, the greater the chance is that they will have head lice. They are spread when kids put their heads together. Head lice are not considered a public health problem nor are they considered a likely agent for the spread of disease or infection. Lice lay eggs and glue them to human hair. The eggs are called nits and their presence is a good indicator of louse infestation. Nits can be mistaken for dandruff flakes, only they are not easily removed since they are glued to a person's hair. A single louse can lay about six eggs a day. Nits can be removed by using special fine toothed combs. There are even special hair salons that specialize in louse removal. Hair Fairies have salons in both Los Angeles and Manhattan and offer "full service" lice removal, which includes evaluations, "nit zapping", and shampooing. They offer game boys, DVD's and toys to keep children occupied while they go about the labor intensive business of louse removal. Cost? Hair Fairies charges $75 an hour and give a 14 day guarantee. Kids are social and according to Hair Fairies (http://www.hairfairies.com/services.html) their salon seems to get a substantial number of repeat customers. Years ago, my wife and I adopted a child from Korea. He was a little over two years old, we named him Tim, and he was delightful as he learned about America and his new American parents. We too learned a great deal from him. My wife took him to the doctor for a routine check up. I remained in the waiting room entertaining my self by reading a two year old Newsweek magazine. I felt that I needed to catch up on two year old news. After a while, time seemed to stop and I started feeling very sleepy and very bored. Finally my wife and new son emerged from the hallway behind the receptionist's desk. "Well," said I standing up and stretching. "How did it go?" My wife did not smile only said: "Put your magazine down, I'll tell you about the exam in the car." It was evident to me that she did not want to say anything in a public place. We finally reached the closed safety of my old Volvo wagon. My wife appeared close to tears. "The doctor says that we have head lice. We got them from Tim, and he probably brought them from Korea." "What do you mean by we?" I asked. "There is a very good chance that the whole family is infected," Groaned my wife. "What are we supposed to do?" I asked. "We are supposed to use a lice comb and then a delousing shampoo. The doctor gave me a free sample, that I put in my purse." Later that afternoon, my wife decided to Shampoo my new son Tim with the doctors sample. "I can't use this stuff" said my wife. It smells awful, and I am supposed to use special gloves. There just has to be something better." I thought for a moment. "I seem to recall seeing some other delousing shampoos. Let me check, before you do anyone. I did ask around, and I spoke with a good friend who I respected. Following his recommendations, I brought back a plain bottle of medicinal soap. "Try this," said I. "I had a doctor friend suggest it to me." My wife looked dubious, then shrugged her shoulders and asked: "Are you going to use it?" That evening we all washed our hair with the new shampoo. It was marvelous, our hair smelled and felt great. Our hair felt light soft and fluffy. We all examined each other to see if there were any nits or anything that might look louse like. It was evident that our whole family had become lice free. This was so much better than the caustic material that my wife took home in her purse from our Doctor. People may wonder what it was that we used, and what sort of a doctor would recommend it to us. The doctor was my dogs Veterinarian, and the shampoo was Hartz Mountain flea and tick. My Veterinarian mentioned that dog shampoo was much milder than shampoos used for humans. He said that many animals' skins are more sensitive than ours. It was with this in mind that I decided to try Hartz Mountain, and I did it with the thought that if it didn't work, we could always use the shampoo that my wife brought home from her doctor. The shampoo worked and we were happy…Who knows, if it worked for us, it might work for you if you ever need it.